There's a lot of experimentation going on in Google Reader. It feels like it's getting more energy than, say, Buggy Blogger (much less the Stuffed Sites). Two to look at are Shared Items and Feed Bundles. Shared Items aren't new, but they're getting more love. I don't know if this is new, but if you go to a Reader-generated post-share page (like mine) and you don't own the page or currently "follow" it, I think you'll see a button to "follow it". I say think because I've only seen it once, and I clicked the button and now I "follow" that person's shared items. Following, as near as I can tell, is pretty much the same as subscribing to a feed though things you "follow" get are added to a special "follow" folder in. So this is a convenient way to add someone to your Reader "People you follow" section. Feed bundles are a subset of the feeds that someone likes that are packaged and distributed separately from their primary feed. In Reader's "Browse for stuff" section you can find over 240 bundles from Google alone! I thought of the Google Reader "Like" button (not available in GR mobile) as a way to vote up posts. These are items from the Internet that you might enjoy. Hit the smiley face at the bottom of items that you like -- we'll customize your list to help you discover even more stuff. My fate is in your hands Lord Google. On my iPhone the sort order of the Smart Playlists for my podcasts is consistent, but nonsensical. Setting the sort order on iTunes has no impact on the iPhone. There’s an older iTunes bug as well - iPhone bug- not updating last played or playlist count for podcasts. This is not the first time Apple's broken their Smart Playlists -- this was a big deal in 2005. Reading the various modern posts it sounds like there are multiple interacting bugs and that playlists that reference other playlists are broken as are podcasts in particular. It feels like someone at Apple has been messing with very old code they don’t understand, possibly as part of iTunes long, slow, migration to being a true Cocoa app. It also feels, as usual, like Apple hates their QA staff. Incidentally, it’s very unclear what Live Updating does now. I can’t find any good documentation on it! What does it mean to have a “smart playlists” that’s not live updated. Is it a kind of temporarily frozen Playlist? Problems with "last played" not being updated and smart playlists not being updated in 2006 - and even earlier. On review of the long, long Discussion thread (Apple used to terminate these more aggressively) it's clear that Apple breaks Smart Playlists in many ways over many years. It's such a fabulous feature, but sometimes it seems like every Brain at Apple went to work on the iPhone. Maybe they just don't have anyone able to manage features this clever. Update 9/29/09: Still broken after 9.02. I've done some further testing, and the only fix that works is to turn off Smart Playlist auto-update -- which basically turns them into dumb Playlists. Update 11/8/09: See Comments. One fix is to create a filter smart list that separates the library into music and non-music, then to use this as a playlist source. Feels like this is related to a problem with different media types being stuffed into Apple's data model. Facing the exact problem as many are describing here, but I found something that absolutely fixed this. All my Smart playlists worked great until I went to iTunes v9. I use a very sophisticated series of nested smart playlists .. only one playlist that I listen to on my iPod and so I was very annoyed when it no longer worked. Ironically, it's probably not actually a bug, but probably the result of Apple fixing a bug. The common denominator was a single standard playlist that would prevent ANY smart playlist associated with it to not show up on my iPod or the sync list in iTunes. I copied the problem playlist, built a smart playlist pointing to it and went through and deleted one song at a time until the smart playlist magically appeared on the sync list for my iPod and the rotation and updates worked. It's not the problem I have, but it continues to point at problems with Apple applying common rules across entities with different attributes. Update 2/3/2010: iTunes 9.0.3 was supposed to fix some smart playlist bugs, but it didn't fix this one. To retain sort order I have to disable Live Updating. Still waiting for a fix. Update 4/7/2010: iTunes 9.1 does not fix this bug. Perhaps the next iPhone OS update? Update 7/4/2010: iTunes 9.2 doesn't fix it. I finally tested on another iPod, this is now just an iPhone bug. I'll retest when I get my iPhone 4. Update 7/8/11: Still a problem with the In Our Time playlist, which is a mixture of podcast and non-podcast files. I exported all of the tunes, deleted everything in iTunes, emptied trash, quit and restarted iTunes and reimported all. Along the way I found some odd behaviors, like two files that were hard to delete. On restore I of course lost all of my Last Played and Date Added metadata, but I can sort them by year. I had to set all types back to Podcast, and to check the 'Remember playback ...' option. Then I played the start of a Podcast. Then I synched. Still doesn't work; last played is not updated. Ahh. I think it's only updating the Last Played date if I play all the way to the end. I also changed the tune type to Music rather than Podcast however. Our four year old Microsoft mice were feeling kinda funky - on XP and iMac alike. Mouse feet intact, but hard to move, kinda erratic. Actually the feet looked a bit ... gunky. They cleaned up easily, but not for long. Right. Mouse pads are both about 15-20 years old. They were last washed ... never. They must be biohazards by now. Imagine the lifeforms. The documentation is unclear, but looking at my Google Calendar settings it looks like you import into an existing calendar. I don't know if it appends or replaces, I'm guessing append. I expect to try this soon for our hockey org calendars. Update 11/1/09: This was an absolute bugger to get to work. Google is pissily picky about the precise format and there are no useful error messages. During the times I was attempting this Google Calender went briefly AWOL -- something that happens far too often. Here's the header and first row of the CSV file that I was finally able to import. It looks like you need the bloody seconds in the date. I worked with Excel for Mac, used the convert functions to turn text into numbers, then chose the precise format, then exported. Google must have given this chore to an intern who they hated. The feeling was evidently mutual. Update 11/29/09b: I'm now using iCal as a tool for faster editing and cleanup of my Google Calendar. It can be exceedingly difficult to get corporate Exchange Server contacts to an iPhone if you don’t have ActiveSync access to the Exchange Server. In this setting you can’t sync work Contacts with MobileMe (you used to be able to, but no longer. I’ve never heard an explanation of why Apple pulled this capability). I don’t think you can use iTunes sync either, though I don’t want to sync my iPhone at work anyway. There are several software solutions that claim to be able to extract these Contacts. I’ve tried most of them – they were either buggy or they couldn’t resolve EX style corporate email references. In Outlook 2003 you could fairly readily export Contacts as vCards, but when I do that with Outlook 2007 I get weird formatting problems. (Of course this is export, not sync, but we can’t be picky here). Here are the details of the initial setup. Once you’re done with that maintenance isn’t too bad. The “source of truth” for the work contacts is corporate Outlook, the “source of truth” for my home contacts is OS X Address Book. This is not synchronization. It is publishing one way. Updates after initial sync are discussed below. There are two sources of data that will sync to MobileMe. Outlook 2003 home: Starts with an empty Contacts Folder. An external data folder (PST) holds material copied from work including all Contacts. Sync OS X Address Book to MobileMe. Sync iPhone to OS X Address Book through iTunes. Set to Sync with Outlook. Click Sync now. On a first sync you will be asked if you want to overwrite the computer or MobileMe. Choose to overwrite the computer. When you are done you will see an Outlook “folder” for each "OS X Group” beneath the original (empty) Outlook Contacts folder. The one called Contacts_Work will be empty. Move (or copy) Contacts from the work PST file to Contacts_Work. I select all, then right click and drag. Clean up the Contacts_Work folder. Remove lists, etc. Sync to MobileMe. Now Outlook and MobileMe are done. Sync iPhone to OS X Address Book  via iTunes. Sync to additional OS X machines as desired. This is all 1 way, so there’s no sync back to the office. This works fairly well for me however. My corporate contacts don’t change that much, but each time I do an update like this I record the date. Then contacts added or modified after that date are periodically carried home, used to update Outlook, and then I sync as above. Synchronization is Hell, but even messaging across databases is Heck. There are attributes and properties in Outlook that Address Book can’t support. There’s location information in Address Book Outlook can’t support. An Address Book contact can belong to many groups, an Outlook contact can belong to only one folder. I try to edit the Work Contacts only in Outlook, everything else only in Address Book. Project Contacts- Now mixing Outlook-Exchange, PST file, Outlook-Home, MobileMe Sync … – an earlier version of this post. I’ve not tried synching my iPhone via iTunes to two machines at home – XP/Outlook and OS X/Address Book. I just didn’t think of that one until I wrote this post! I know there’s some multi-machine sync capability with the iPhone. I also sync my iPhone to Google by ActiveSync (Exchange server) protocol. So I have my Google contacts on the iPhone too. There’s a ton of duplication on the phone between the OS X source and the Google source. Resolving that is a future task. This is what I currently do. I may try just synching wirelessly to MobileMe. I assume Contacts that belong to several OS X Groups are duplicated when they go to Outlook. I wonder why they don’t proliferate, breeding with each sync. I'm back using Access 2007 a year after I wrote about Microsoft Access 2007 reliability issues and suggested workarounds. In the interim I've been using Access 2003 again. There are some good things about 2003 (ok, just Sharepoint support), but, by and large, it's busted. It's broken in deep and inexplicable ways. Heaven be your friend if you should change a column name -- you may get weird and persistent side-effects. Update 10/22/09: A bit more detail on the two latest bugs, now that I've figured them out. I was getting a common and useless error message: The setting you entered isn't valid for this property every time I ran a query on a link to a Sharepoint List who's schema had changed since I'd created the link. In particular a field had gone from memo to string. I had to delete the link and create new one. Access 2007 is supposed to be able to regenerate its link on command, but it turns out that doesn't work. The other bug I got was related to creating an alias to a Sharepoint List column name where the alias happened to be identical to another Sharepoint Column name that wasn't part of the query. Turns out it sort of works, but not really. I’ve had some luck so far with MobileMe, but this time I ran into a complete fail. It wasn’t completely unexpected. I’ve been using LogMeIn to do remote maintenance of my mother’s Mac Mini, often using my old XP machine. It connects at the machine level; I can log out of her account and connect to the admin account in one session. Today performance using the Firefox plugin was excellent. MobileMe’s Back to My Mac works very differently. It connects at the account level, and it’s designed as it’s named – to connect between two OS X machine-user-accounts that share the same MobileMe name. In other words, to connect to one’s own account – at the machine level, not the account level. I had to setup an account on one of my machines with the same MobileMe user name as my mother. Then I could try the connection. As promised it did show her machine in my Shared device Finder display, but when I tried to connect I got a “connection failed” message. I assume my mother’s cable modem/router configuration is not supported. Even if it had worked though I wouldn’t have been able to switch to her Administrator account, B2MM is an account level connection only. OS X remote maintenance is certainly unimpressive. I’m even more impressed now with LogMeIn. This MobileMe feature failed. Click the Start menu and choose Network Connections > My Network Places. In the window that opens, click "Add a network place" to open the Add Network Place wizard. On the next screen, click "Choose another network location." I thought the problem was that my user name had a dot ‘.’ in the middle of it. MobileMe usernames become webdav directories. So I tried http://idisk.me.com:80/first.lastname/ (actually, I forgot the terminal ‘/’ but it worked first try. I just had to enter my username and password, telling XP to remember the password. Update 10/21/09: I tried this on another XP SP2 machine and all I had to do was enter http://idisk.me.com/YourMemberName/ with the trailing forward slash (per directions). I don't know what's really going on here. If you're having problems first try the forward slash, next try entering the port. I can't tell if this was ever included in any XP service packs, I don't think Microsoft always includes all of their fixes. To configure the locator service you need to add a MobileMe account in the Mail, Contacts, Calendar Settings domain. I added my phone and, for the moment, turned off all synchronization other than location. Push support must be enabled on the phone. You can make it play a sound, even when it’s in silent mode. You can locate it on a map. Currently Apple uses Google maps. Getting the refined location takes a few minutes. When the phone was in a room in my home I could locate it within a 2 block radius. I put it on the window sill where it might get a GPS lock and it centered on a spot between my home and my neighbor’s home – about 30 feet from its actual location. You can lock the phone using the remote lock. You can remote wipe the phone, after which it cannot be located. The activation procedure I followed was identical to a single user activation. I tried reactivating using my old .Mac username, but MobileMe was unable to connect it to the current password. I wonder if a .Me version of the old account is in limbo with an old password*. So I have a distinct iTunes/Apple account and MobileMe account. That’s probably a good thing. The first account you use is the Master account. So I am the Master of my family. That’s nice. In Settings I configured my Mail to 1GB (it will not be used) and iDisk to 19GB. The Family Pack comes with 20GB of storage and a 200GB monthly data transfer limit. It turns out that package description is misleading. I thought there were four MobileMe accounts. It appears there’s 1 Master account (20GB) and four minion(?) accounts, each with 5GB of storage. So total storage is 40GB. I don’t know if the 200 GB data transfer limit is for the master account or for all accounts. I put a reminder in ToodleDo to renew a few weeks ahead of the displayed expiration date. See: The MobileMe Massacre begins. * So if you discontinue a MobileMe account, you may wish to keep the last good password around. Update 10/21/09: See MobileMe- Perspective of a crusty Palm veteran, a review I wrote in July 2009. Back then I was able to get my original .Mac username and convert it to me.com, so I should have tried to claim my un with a .me extension. Update 10/21/09b: You can remove family member accounts and thus recycle them. It's in the Account Options menu. After several years of watching with vague disgust, I purchased a MobileMe 4 5 person family pack (via Macintouch referral link) from Amazon for $123. It took 12 days to arrive, which is about 3 times as long as I’d expected. Outlook 2003/2007 synchronization to MobileMe contacts, as used in my Contacts project. (The SyncWiz failure persuaded me to seek the only Outlook AddIn Contacts Sync solution I’ve had success with). I don’t think I have any use for the Calendaring, bookmarks, email, or photo gallery services. I certainly don’t want to commit my data to MobileMe; Apple is to Data Freedom as the Birthers are to Obama. I will have more to say about each of the features I use, which is best done in stages because MobileMe is a fairly amorphous and fluid set of services. Some of the capabilities are OS X specific, and some are probably 10.6 specific (or less buggy on 10.6). Some are iPhone specific (locator), some are iLife specific (albums, iWeb) and a few work with a PC (which I actually need). In general the more Apple products you use, the more MobileMe becomes a reasonable purchase. I’ll add links below to the next few weeks of reviews. MobileMe- Perspective of a crusty Palm veteran. I wrote this in July 2009. We won’t see a fixed MobileMe until 10.6 is out: Well, 10.6 is out, and I'm not so sure MobileMe is fixed. Update 11/7/09: I've discovered that even iCal is synchronizing even when it's disabled in MobileMe preferences. Obnoxious bug. Update 2/27/2010: MobileMe file sync disappoints. IE has had this behavior since at least IE 3 (was there an earlier version?). Safari (webkit) added it in 3.1, and Chrome has always had it. I love the fact that these 3 browsers display the page title field. It’s annoying that Firefox doesn’t. Now, this isn’t the biggest problem with Firefox today. Still, it’s symptomatic. I used to use Firefox everywhere. I now use Chrome on XP, Safari on OS X, and Camino on our 10.3 iBook. * Chrome is the only one to put the hyphen after the name of the blog. Nice touch. 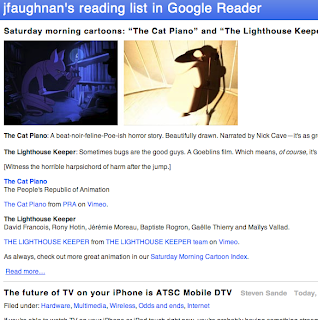 Google Reader has been my primary feed reader on my iPhone and desktop since I left Bloglines in 2007. It’s a great reader, but I especially I love the ability to search my read, starred and shared posts, and to incorporate my GR feeds and my blogs and legacy pages into one custom search. Since May of 2008 I’ve also been sharing my annotations on posts, and using Google Reader as a micro-blogging platform. Unlike Twitter posts, these GR micro-posts work with my memory management strategy . My GR micro-blogging has changed what I right here. 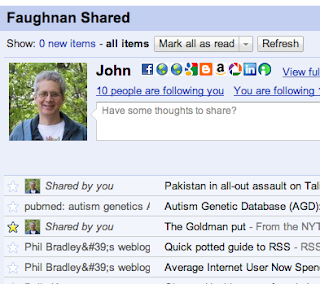 Many of the small frequent posts I used to do are now simply shared items in Google Reader. This feed currently does not work in IE 8 or Bloglines and probably doesn’t work in Outlook 2007 (does anyone still use Bloglines or IE?). It works in Google Reader (of course), Firefox, Safari and OS X Mail.app. Be warned that my GR feed includes everything I’m interested in, so it’s high volume and undifferentiated. It mixes geeky stuff with politics, science, etc. I’m going to be including a link to my “Google Reader Shared Item Feed” at the bottom of most posts from this blog and Gordon’s Notes, so you can pick up or drop the feed at any time. I should be easy to find. How do I share my Google Reader Shared Items Feed and process it via Yahoo Pipes? ... The keyboard will sell for $30 with $5 shipping to the United States. There are prototypes in beta test now that have rubber keyboards. The final version will be made of hard plastic, said Mr. Nykoluk. I noted it back then in my Google Reader stream. I though it was at best a trick, at worst a scam. There's no iPhone OS support for an external keyboard. Now, looking back, I realize what they've done. They've put a mechanical prosthesis atop the virtual keyboard. I presume they're using a small battery so it emulates the electrical properties of a fingertip. Now the Canadian angle makes more sense; you could operate this thing with gloves on! It's ingenious in a sick sort of way. Mindjet’s MindManager is an exotic organizational/planning mind map app for XP and, to some extent, for OS X. Definitely for corporate use -- it’s expensive, proprietary file format, completely data locked (no data freedom here!) but very pretty. Pretty matters in the corporate world. I use it a lot, and today I ran into a nasty bug. I assigned a set of items task/hour info, then used the “roll up” feature to summarize them at a root concept. The rollup displayed days instead of hours. That’s ok, but MM rounded up the task hours on every item to days – and the act is not reversible. I lost all my item-specific task data. I don’t think this always happens – it’s too obvious a bug. I do have a very large and complex map. Still – be warned. If you’ve found this post because you ran into the bug please leave a comment. If I get a few I’ll rouse myself to file a bug report with MM (though I’m not sure they take bug reports).